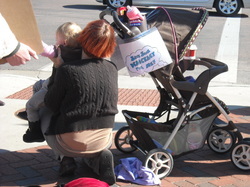 In solidarity with Occupy Wall Street, Vermillion held its own public meeting on October 15, 2011. Many speakers, musicians and supporters came out to discuss our frustrations with the current economic/political system and share ideas for positive change for the people. Our meeting was small but beautiful and inspiring. It's great to see a small town like Vermillion rising up with the rest of the country to speak out, every person counts, we are the 99%. Hopefully we will be organizing another event next weekend, check out http://www.meetup.com/occupytogether/Vermillion-SD/ for details. Also to keep up on the world-wide occupations, check out http://www.adbusters.org/campaigns/occupywallstreet . Check back for videos from this weekends gathering!